Dr. Thomas Brennan Presents at the Transportation Research Board Annual Meeting in D.C. This year from January 7th – January 11th, Dr. Thomas Brennan, Associate Professor in the Civil Engineering department, had the opportunity to present two research papers at the Transportation Research Board Annual Meeting held in Washington D.C. This year, the Transportation Research Board Annual Meeting gathered about 13,000 people from the transportation professional field. One of the papers presented, entitled “Performance Measures for Characterizing Regional Congestion Using Aggregated Multiyear Probe Vehicle Data”, analyzed speed data in an effort to better understand congestion. 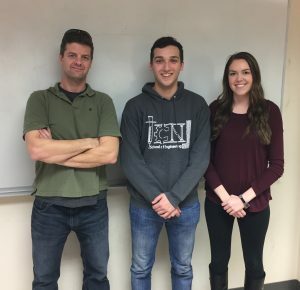 This research was done over MUSE during the summer of 2017 with two junior civil engineering students, Anthony LaRegina and Ashley Hyde. The paper written as a result was accepted into the Transportation Research Record, which will soon be published in 2018, making it LaRegina and Hyde’s first publication in a research journal. The project was funded by the University Transportation Research Center, Region II. Below is the abstract, along with a graph taken from the article. 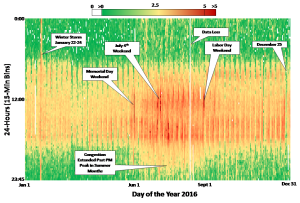 Abstract: Predefined spatially located segments known as Traffic Message Channels (TMCs) are linked to commercially available, temporal anonymous probe vehicle speed data. This data has been used to develop agency-wide performance measures to better plan and manage infrastructure assets. Recent research has analyzed individual as well as aggregated TMC links on roadway systems to identify congested areas along spatially defined routes. By understanding the typical congestion of all TMCs in a region as indicated by increased travel times, a broader perspective of the congestion characteristics can be gained. This is especially important when determining the impact of such occurrences in the region as a major crash event, special events or during extreme conditions like a natural or human-made disaster. This paper demonstrates how aggregated probe speed data can be used to characterize regional congestion. To demonstrate the methodology an analysis of vehicle speed data during Hurricane Sandy, the second costliest hurricane in the United States, is used to show the regional impact in 2012. Further, the analysis results are compared and contrasted with comparable periods of increased congestion in 2013, 2014, and 2016. The analysis encompasses 614 TMCs, within 10-miles of the New Jersey coast. Approximately 90-million speed records covering five counties are analyzed in the study. For the other paper presented, entitled “Enhancing Traffic Enforcement Strategies Using Speed Data”, Dr. Brennan worked with Wayne State University, located in Detroit, Michigan, to find potential use of speed data to improve law enforcement practices. This paper is currently under review for publication in the Transportation Research Record. Below is the abstract for this paper. Abstract: Traffic enforcement is a critical component of keeping roadways moving efficiently and operating safely. New federal initiatives for both law enforcement and traffic engineering call for the use of data analytics and performance measurement of roadway systems to maximize utility of limited resources. Speed data from telematics, including cellular phones and GPS devices, in vehicles has emerged as a valuable asset for the measurement of roadway mobility. Crash data has also improved with the addition of spatial coordinates associated with the crash reports. These data, when combined, can be used to identify and prioritize roadway locations in need of traffic enforcement. This paper presents a scalable methodology to fuse both crash data and speed data to prioritize highway traffic enforcement locations. Interstate 75 in Michigan and Interstate 80 in New Jersey are investigated using spatial analysis of crash records covering over 500 miles of Interstate and 120 million speed records. Performance measures are created from the data which identify locations on these interstates where there are high speeds and frequent crashes. The paper concludes by recommending the use of GPS tracked probe data as a tool for traffic enforcement to determine best practices moving forward. Congrats to Dr. Brennan, Anthony LaRegina, and Ashley Hyde on their research accomplishments!